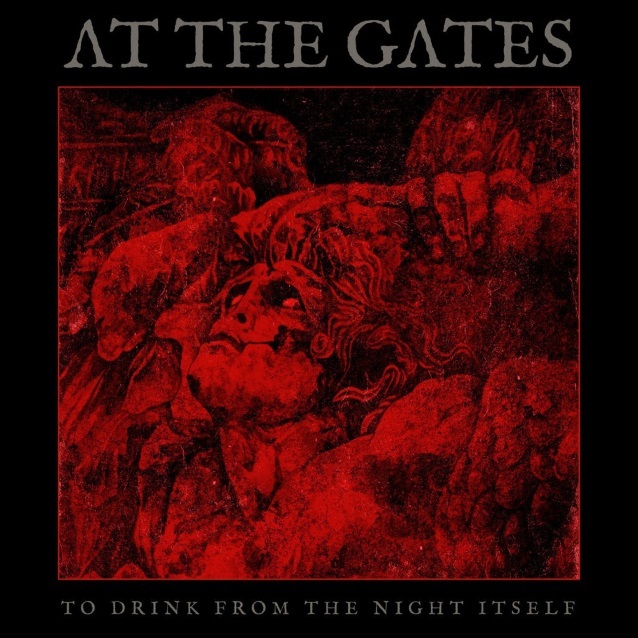 The official video for “To Drink From The Night Itself”, the title track of the new album from Swedish melodic death metal pioneers AT THE GATES, can be seem below. The clip was directed by Patric Ullaeus, who has previously worked with IN FLAMES, ARCH ENEMY and DIMMU BORGIR, among others. AT THE GATES frontman Tomas Lindberg comments: “So, for the first song to present to the public, we chose the title track of the album, which is also the opening track of the record. To us, this gives a presentation of the attitude of the album: raw, hungry and desperate. It also gives an introduction to the whole concept of the record. “We live through our art, and the whole album deals with the concept of art. Art as a tool either for revolution, or suppression. To drink from the night itself is just that, a metaphor for living and breathing through art. Of course, the concept goes deeper than that, but this song is the heart of the concept, the fierce call to arms so to say. We are still at war, but this time we are fighting the abyss, the abyss of apathy and oppression. It is an aggressive song, but also contains a lot of the other elements of the band’s sound on this record. Melancholia, desperation and struggle. “To Drink From The Night Itself” will be released on May 18 via Century Media. Produced with Russ Russell (NAPALM DEATH, THE HAUNTED, DIMMU BORGIR) at Parlour Studios in the U.K., the follow-up 2014’s “At War With Reality” will feature conceptual artwork created by Twilight 13 Media‘s Costin Chioreanu, who previously worked with AT THE GATES on the band’s last disc. Lindberg comments: “It has once again been an absolute pleasure working creativily with Costin. “We had a lot of ideas for what we wanted to get across with the art this time around. Overall they were, not surprisingly, related to the general concept of the record. “What is great with Costin is that he understands the band. He knows what we are and where we come from. And me and him also have a strong artistic connection. “The inspiration for the actual front cover piece is taken from the Pergamon Altar, on display at the Pergamon museum in Berlin. It is, of course, linked closely to the concept that the whole record is based upon, but more on that later. But I will throw a name out there, for the interested ones; Peter Weiss.